Sensationalism verses credible facts. 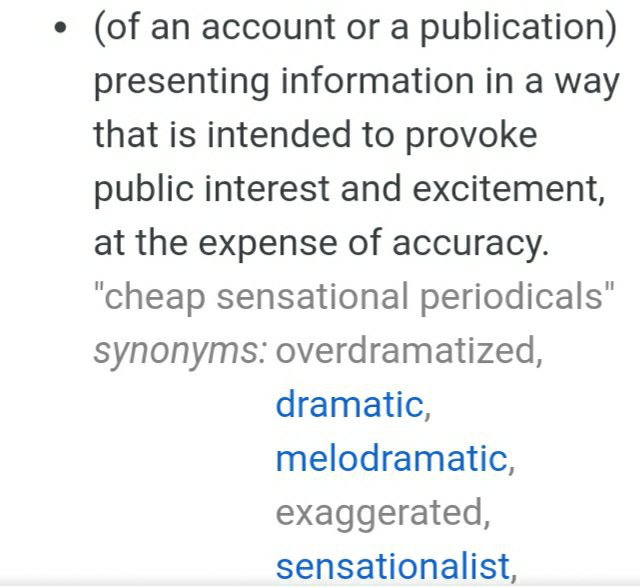 What is sensationalism? Wouldn’t it be wonderful if as Christians if we were as excited about Gods word as the sensational media is about spreading half truth or inaccuracies? What if we simply proclaimed Christ is the Messiah, the Son of God, the only salvation and the only way out of the destruction coming upon our world, or how about Christ is the only salvation for Gods judgement on an unrepentant wicked earth? And list scripture that proves it. Instead we prefer the sensational. Instead of reporting or spreading the good news many succumb to sensational interpretations and commentary. Like the headlines in Drudge that say people will soon worship artificial intelligence as the messiah. News flash, they already do. Take Alexa for instance, really? Take a walk down the street or any public place and see what controls people. Even driving, the phone is in their hands and faces. What if we as Christians, simply turned to God’s word. We know who Christ is, we know what His mission is and we know He’s coming back, all from Gods word. We don’t have to sensationalize this by applying men’s interpretations, the Holy Spirits guidance and knowledge is all we need. That is why we don’t allow or buy into sensationalism here. Is it any wonder the more sensational a story is the more people are drawn to it. So is the way satan operates as his task in the earth is to kill steal and destroy, and this is why our saviour came to restore and to give us hope (John 10:10). Now is the time to stand for the truth of Christ, for the day is coming when those who follow unrighteousness will see God will have no problem with sending these people strong delusion so they will believe a lie, and in the end will be damned! (2 Thessalonians 2:10-12). Christians are being beheaded, crucified, tortured and arrested in Islamic ruled areas simply for believing in Christ! A Christian Missionary was just killed in a muslim country, Asia Bibi’s freedom caused a whole country to demand her death, you want sensationalism look no farther than this. It’s prophesied and its happening in real time. Yet no one wants to believe this. No one wants to emphasize these things. As sensational and truthful as these things are no one is excited about this. Sensationalism of the truth, is what we stand for, based in fact not translation of men. For example take a trip to you tube and type prophecy in the search bar. You will be shocked. Prophecy is apparently a money maker with the sensationalist. Headlines like “Antichrist revealed” or ancient Jewish prophecy predicts Messiah.” We only need Gods word and discernment to know what time we are in. Why do people fall for the sensationalism stating antichrist revealed. There are so many antichrists in our face in plain sight today that Gods word confirms its unconscionable to rely on the sensational based on the false. John and Christ both tell us that there were, are and will be many antichrists before His return, yet the sensationalist have it pinned as one and know the identity. Or they know the date of His return, even though Gods word tells us no man will know. It’s beyond comprehension. Yes, point out the signs, point out the wickedness of men, and point out the obvious. Have we become stiff necked like the Pharisees of Christ’s time, when He told them they couldn’t see the Messiah in front of them?